I have been more that a little bit slack with my blogging this year, but it's a book like this one that make it easier to get on the computer and start typing because I just want everyone to read it. It was originally published in hardback in 2011, but is now out in paperback. Jack and his Mum are on a camping holiday in the Acadia National Park in Maine. On the very first morning, Jack wakes up to find his Mum gone, she's taken her tent and the car. Jack doesn't tell anyone, his Mum has left him before, so he sets out alone to find her, because he is sure if he tells someone what happened, they will take him away from her forever. 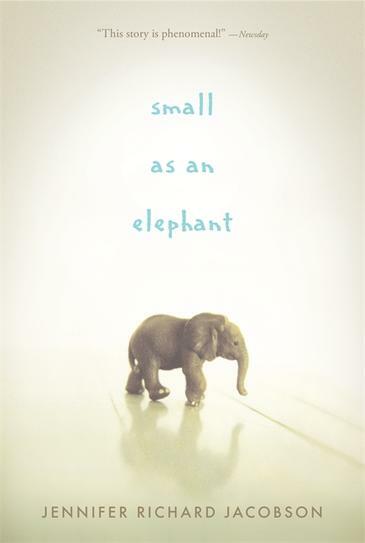 So they story begins of 11 year old Jack, who all alone, begins his search for his Mother, and when he realises that he may not find her, his journey to get back home, with one important stop on the way...to see Lydia, the elephant. Heartbreaking is the word that springs to mind when I think about this book. The reason for this is that despite everything, Jack loves his Mum, and he doesn't want to get her into trouble. He thinks if he gets caught, his Mum will go to jail for leaving him. Imagine the life of an 11 year old boy, who would rather eat food out of a dumpster and sleep in the woods than give himself up and be somewhere safe and warm...heartbreaking. This book is simply written, but it has a lot of heart. I think it will be a book that teacher's will jump on to use in the classroom, and Candlewick Press have even provided a teacher's guide.